In the old straight deck days, two people worked in unison to get an aircraft safely down on the deck; the pilot and the batsman, the latter was essential because the pilot couldn’t see the flight deck over the aircraft’s nose. There were good batsmen and some less so. The epitome of the good batsman to me was Teddy Genge, one of our two batsmen on loan from the RN during the Korean War. Teddy stood rock solid on the batting platform and if he gave you a signal you knew that you had to respond quickly otherwise you would soon be in trouble. The other batsman was Sid Richardson. Sid was a little generous with his correction messages, but nevertheless would get you down OK. The down-wind leg was flown at 450 feet (the flight deck was 44 feet above the water). The drill was to aim to be at a steady 90 knots (in the case of the Firefly) at the 90 degree, being careful not to trail which was caused by turning in too late. The result was that the batsman would disappear under the nose of the aircraft. If you waited until it looked right to turn in from the downward leg as per an airfield landing, it was too late as the ship had advanced by the time you got to the ninety. An RN Batsman encourages this Firefly with bats and a bit of body language. Image: Vintage Wings of Canada. An article on Batsmen, or ‘Landing Signal Officers’ can be seen here. Two signals were compulsory, the cut and the wave off. The cut was given by the right bat being rapidly crossed over the batsman’s chest; the wave off by both bats being waved together over the batsman’s head. One of our batsmen, having given you every signal in the book, and possibly twice over, would decide to curtail the approach and wave you off. Unfortunately, he caught me out twice by advancing his right bat much quicker than the left which looked like a cut. My poor Observer almost had a heart attack as the power was cut and then immediately poured on again. The batsman’s aim was to get you into an imaginary box from which a landing could be safely achieved. He would make the cut appropriate to where you were in the box. A little high and fast would trigger an early cut, the converse would mean a late cut. In the final stage of the approach as you were close to the roundown, you would get a small flick of the bats to straighten up. With experience, you would reduce the power you were carrying to maintain the turn; just a tad to prevent a small climb developing, waiting for the cut. Having received the cut, the throttle was rapidly closed and the nose was allowed to drop, which it did with the reduction in power, this gave you an instant view of the deck, enabling you to make minor adjustments in lining up, and to assess your height. This was the critical point of the whole of process of achieving a successful landing, the aim being to flare the aircraft into the three-point attitude, just over the deck, with zero vertical velocity. Done the properly, the result would ensure you hooked a wire. Above left. The critical manoeuvre was flaring the aircraft to achieve zero rate of descent just above the deck, as this aircraft has done. Errors in flaring were the most common mistake, resulting in a bounce over the wires, or ‘floating’ over them. The result, more often than not, was entry into the barrier (above right). RAN images. Should the aircraft fail to hook a wire, or the hook bounce (an initial problem with Fireflies), it was into the barrier. The bounce problem was subsequently corrected with a mod which also made the hook lower much further. We had a few RN aircraft on loan with this mod which was apparent when forming up after a bombing mission, as you looked to see who were the lucky ones! There were two barriers which were raised and lowered hydraulically to enable aircraft to taxy forward into the forward deck park. The Firefly was fitted with a belly hook and the Fury with a sting. 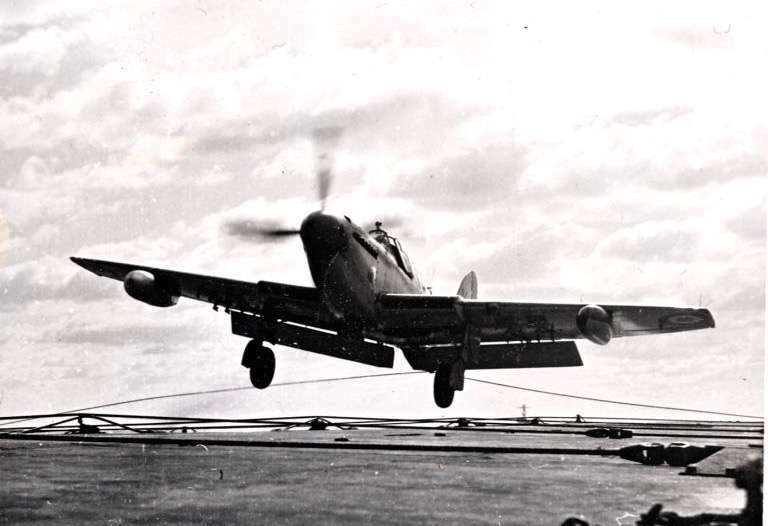 This meant that the Firefly could catch one of the later wires and stop short of the barriers (except 10 wire), but the Fury was not so lucky. As experience was developed, a good barrier operator could make a quick assessment that a wire had been caught, albeit a late one and drop the barrier, this saved a few pilots from embarrassment. My course mate and I did our initial deck landing in HMS Illustrious of WWII fame. My first attempt resulted in a bounce but fortunately I hooked a wire; this caused the aircraft to slam down on the deck resulting in slight stressing of the centre section. My mate, Blue got the cut and immediately flared with the result that he went full tilt into the barriers shedding his flaps, undercarriage, and airscrew. He proceeded up the deck, skidding on the fuselage, stopping just short of the port forward 4.5-gun mount. To both our surprise he received an above average for deck landing. It was the first barrier I witnessed and, as outlined, it was a full bottle effort; the noise was remarkable! 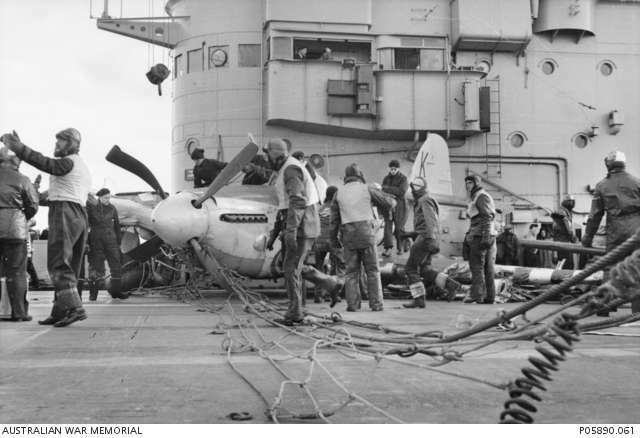 There was no doubt that constant practise was essential to maintain a high standard of deck landing; this was proved during the Korean War when the work up was a disaster, but the subsequent two-ops-a-day resulted in few accidents. When we moved to the angle deck life became a little less stressful: at least if you missed the wires you only hurt your pride as you bolted. I deck landed the Gannet in HMS Bulwark and HMAS Melbourne, and the Sea Hawk in HMS Centaur, but unfortunately not the Sea Venom and hence cannot comment on it as a deck lander. In conclusion, straight-deck landing was an art requiring very fine tuning of height and speed control, and once learnt resulted in a successful landing every time, as 255 accident free arrivals attested – although I must confess that I had the odd hairy arrival in the early days. 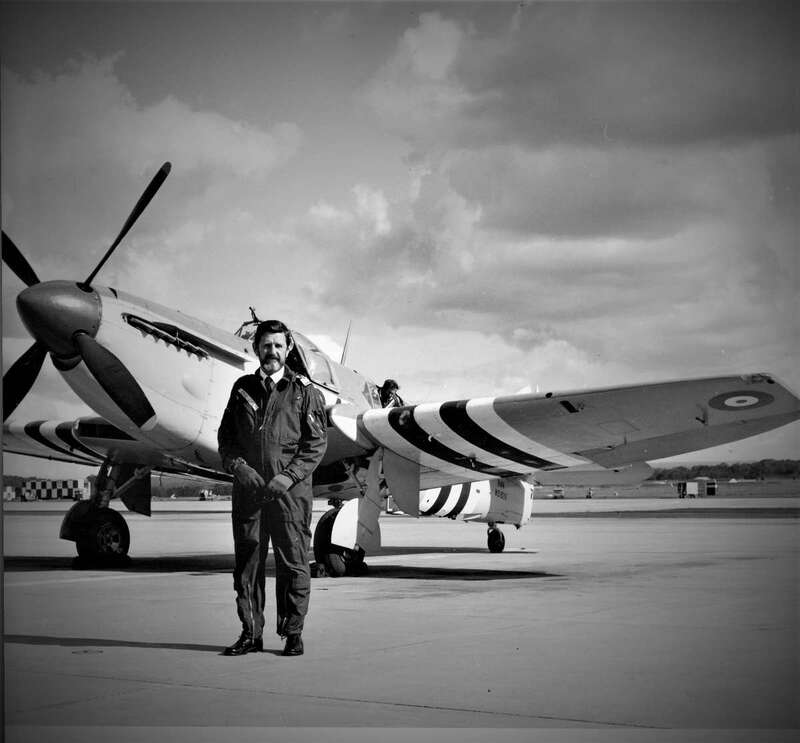 Commodore Norman Lee joined the RAN as a recruit rating pilot in 1948, and served in 817, 816, 850, 723, 724 and 725 (RAN) Squadrons in addition to exchanges to 736, 738 and 820 (RN) Squadrons. He Commanded HMA Ships Vampire and Queensborough. His final posting in the RAN was as Commanding Officer HMAS Albatross before his retirement in 1981. He now lives in Canberra, ACT.